Cut off all gristle & skin bits that may still be on the breasts. Slice lengthwise into 1/2 thick strips. In a wide, shallow bowl or dish, place your sauce. In another, mix the flour & bread crumbs. Dredge each slice of chicken in the sauce, then roll in the breading mix. 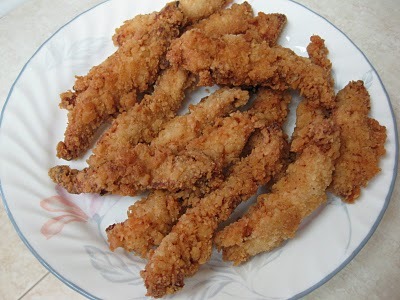 For extra-crispy strips, dredge & coat a second time. Fry strips for about 5 minutes or until golden brown. Place a thin layer of oil in a frying pan. Add onions, parsley, potatoes & powdered spices. (amount of powdered spices is all up to your personal taste) Fry for about 5 minutes, drain off excess oil. Transfer wedges to a foiled cookie sheet and bake for about 15 minutes at 350 degrees, or until crispy & brown, turning at least once for even cooking. You can also do this with fresh potatoes, cut into wedges. If you use fresh potatoes, fry them in the pan until they are fork-tender, then transfer them to the oven for about 15 additional minutes.